My friend Connie and I recently took a trip down to San Antonio for a lady's shopping Saturday. We decided to stop for some tasty Mexican food while we were down there. While I usually visit Mi Tierra while I'm in SA (mm, pan dulce), this time I was persuaded by Lee to try La Hacienda de los Barrios on the north side of town. 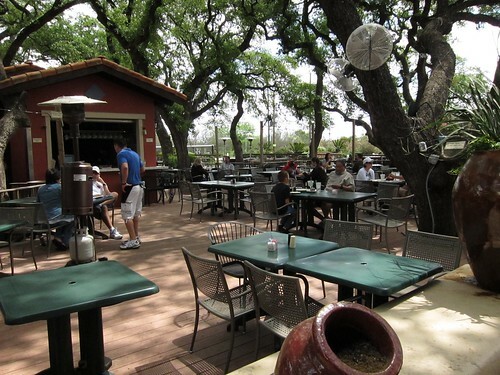 Its in an unassuming suburban neighborhood, so we were a little thrown off driving up, but when we got there, we were immediately excited by the patio alone. It was huge, shaded, and quite lovely. Isn't this patio lovely? The inside was nice, but not as breathtaking as the patio. Sorry! The inside of the restaurant.. in case you're totally stupid and want to sit inside..
Connie got an order of the deep fried quesadillas. Corn turn-overs filled with white Mexican Cheese and Poblano pepper slices, fried to a golden crisp. These little corn pockets were amazing. I've never had deep fried quesadillas, but Connie assured me her Mexican momma used to make them this way. I got an a la carte plate with a Famous “S.A.” Puffy Tacos and a Quezataco. 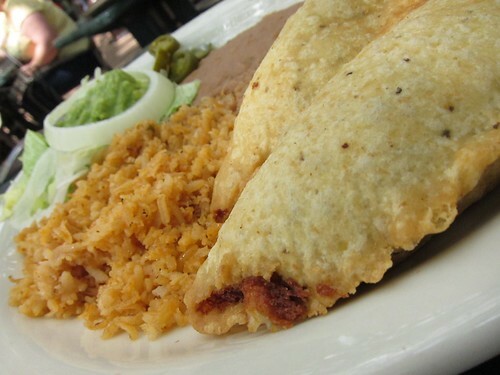 The Quezataco is a handmade Corn Tortilla filled with beef fajita, bacon, and white cheese, garnished with guacamole. The "famous" puffy taco was totally gross. It was greasy and tasteless. It was so unappetizing that I only took two bites before putting it down. The Quezataco on the other hand was sheer taco perfection. I've never had bacon on a beef fajita taco, but is was a great combination And the homemade corn tortilla was wonderful. 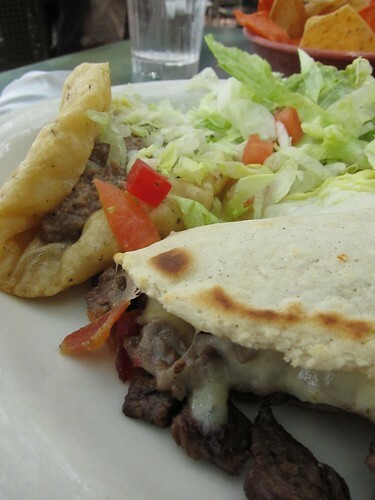 The perfect bite and so flavorful. I still have slightly inappropriate dreams about this taco. 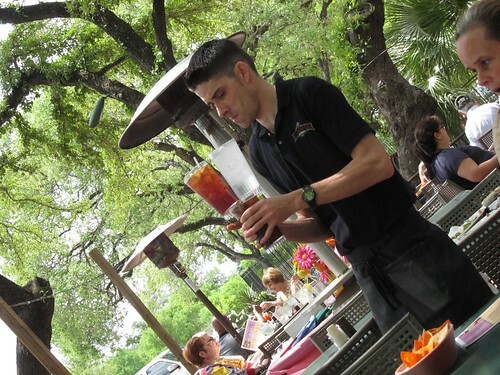 As we sat and enjoyed the lovely afternoon, we noticed a waiter with several water glasses perched at precarious angles. Thats when we had an a-ha moment. You know the the little notches on the bottom of some plastic water glasses? They actually serve a purpose. You can stack them! We saw one waiter with a stack of glasses that were 3 high. Woh. 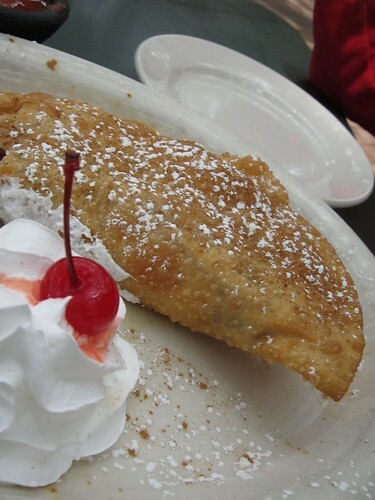 For dessert, we tried the Empanada de Guayaba - a deep fried turnovers filled with guava and cream cheese. It was only ok. The guave was served in chunks and was too subtle a fruit to stand up to the creamed cheese. The chunks also added an unappealing texture next to the soft creamed cheese and the soft crepe-y empanada wrapper. This place is also family friendly. 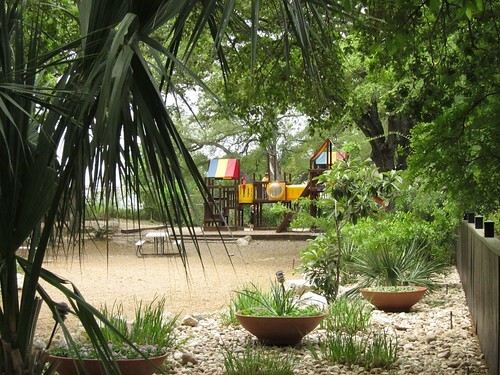 Check out this awesome playground. How'd you like to have played in that as a kid? 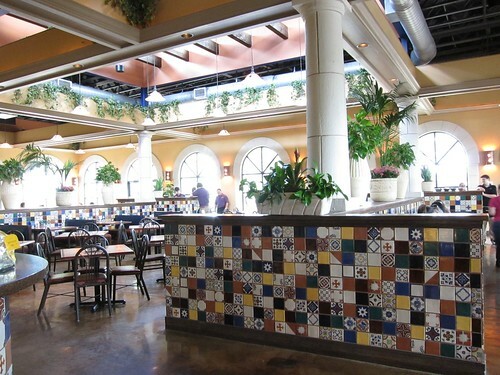 Bottom Line: Some great home cooked Mexican food, some not so great, but its all served on a lovely patio.